I’ve never been one for customizing board games. Drew loves it – mash ups and tweaks and custom-modes of games he loves. I long found the process tedious, though, and honestly would rather just play an already good game. But things change when you have kids. First of all, they can’t really play the games you love, at least not right away. And this would be fine except my son, who turned four over the summer, really wants to play the games he sees in my office – the “big kid” games. Loopin’ Chewie has been a big hit. He has a collection of his own – a decent sized one for a child his age – but when he sees the boxes for Ticket to Ride or King of Tokyo he gets excited and wants to join me at the table. So I’ve changed things up a bit. Where once I was averse to any major rule tweaks or variants, I started to shake things up. Removing rules that were too much for a young child, taking out components that required extra reading, and reducing head to head confrontation when it would make things just a little too intense. And you know what? I really enjoy it. 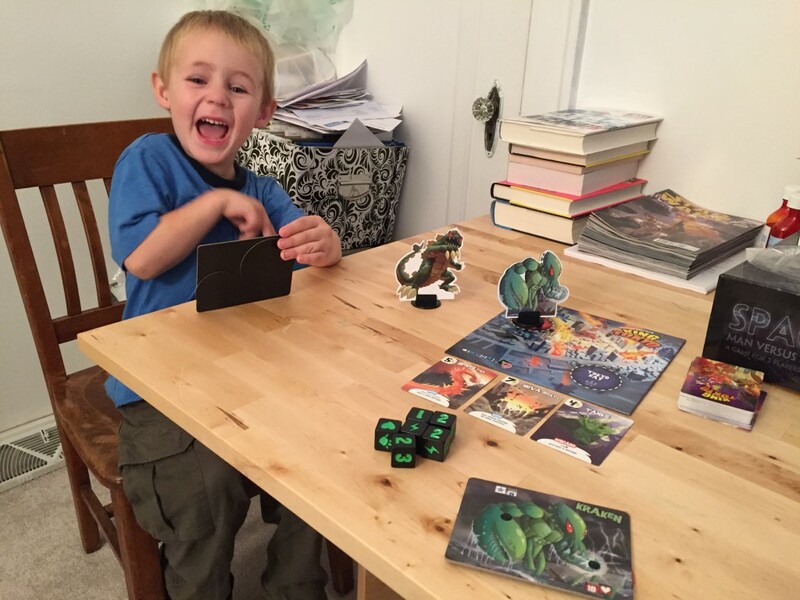 It’s a balancing act to be sure – one week a game like King of Tokyo was too confrontational and made my son agitated and upset, even with a lot of the extra bits removed. The next week he turned a corner and was about hitting (and being hit) with as many claw dice as could be mustered. The vast majority of the games I play with my son are age appropriate. We have a six-foot Busytown roll and move game, Boggle Jr., Jumping Jack, and a completely unnecessary but equally awesome Star Wars rehash of Loopin’ Louie (Loopin’ Chewie). We play them a lot, but every now and then he wants to sit down with me and shuffle the cards, roll the dice, and handle the miniatures, and that means some serious tweaking. For a long time, I did this with solo games. I would play a solo game that had just enough components that his role could be ferrying those components across the table or helping me setup or take actions on the board. Imperial Settlers was our favorite, but we also played Pandemic, Friday, and most recently Hostage Negotiator. This was perfect. 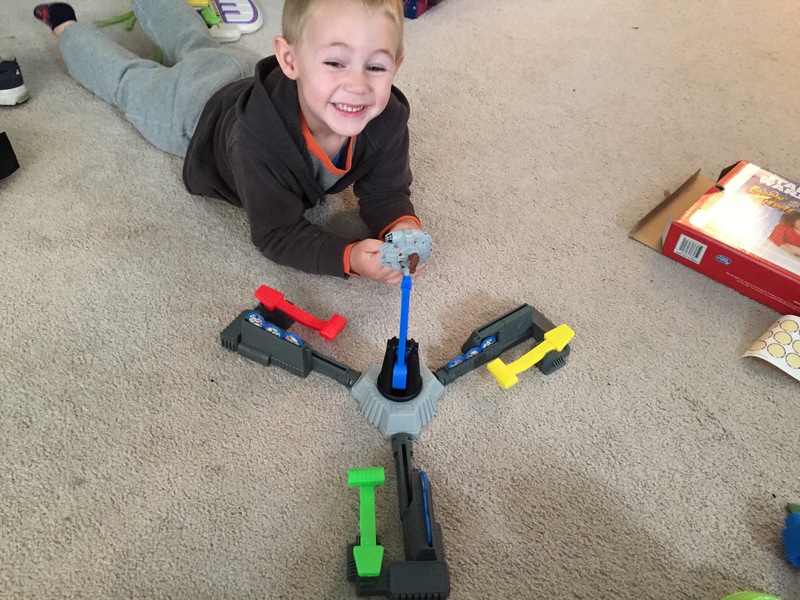 He could play with trucks and game components, I could play through a game with little or no tweaks and we spent some quality time together. Ticket to Ride – I honestly didn’t think this would go over well, but a game filled with plastic trains, a big map of the United States and a train/geography obsessed four-year-old make this a favorite for both of us. We’ve yet to finish a full game, but the lack of text on cards mean we can play it with few or no changes and have a lot of fun. King of Tokyo – We discovered this one just this last week and it’s been a real blast. The idea of attacking and controlling Tokyo with giant monsters has really captured his imagination. He now pretends to roll dice and talks to his mother about how many claws he got as he attacks the couch pillow – quite possibly nothing cuter. We’ve removed the cards for the most part to avoid any excess reading that he’s not able to do on his own, but everything else in the game works perfect. Castellan – A perfect game for him. We play this one quite frequently and he’s very good at it, going so far as to count out the turrets (quite loudly) to determine which pieces he should play and when. X-Wing Miniatures – To be fair, there are very few cards played and the rules get stretched frequently, but pushing miniature X-wings and TIE fighters across the table keeps him engaged for much longer than I’d expect. Other tweaks to make this work – we don’t worry about factions, points, or pilots. Just flying and rolling dice – about as simple as you make it. It’s a lot of fun and I’m often surprised by just how engaged and capable he is in these games. At the same time, I start to see just how healthy this hobby can be for a young mind – the mathematics, the reading comprehension, and the sheer abstract thinking required just to play, let alone to win a decent board game makes it an activity I’d much rather him engage in than video games or YouTube videos. We’re moving up the totem pole of games and I’m excited to keep trying new and interesting games. Mice and Mystics has been sitting on my shelf since he was 15 months old and we’re getting very close to that becoming a regular event in our home (one even my wife is excited to join). And then there is the step beyond that – actually designing games. As I stated earlier, board game design never quite interested me, but seeing the hobby through the eyes of a curious child who is all too happy to change rules to fit his imagination, I find myself wanting to start playing with bits and tweaking the experience. Geek Dad’s “Awesomely Geeky Projects and Activities for Dads and Kids to Share” has a couple of “make your own board game or RPG” activities in it that I’m excited to bring out in the next year or two. 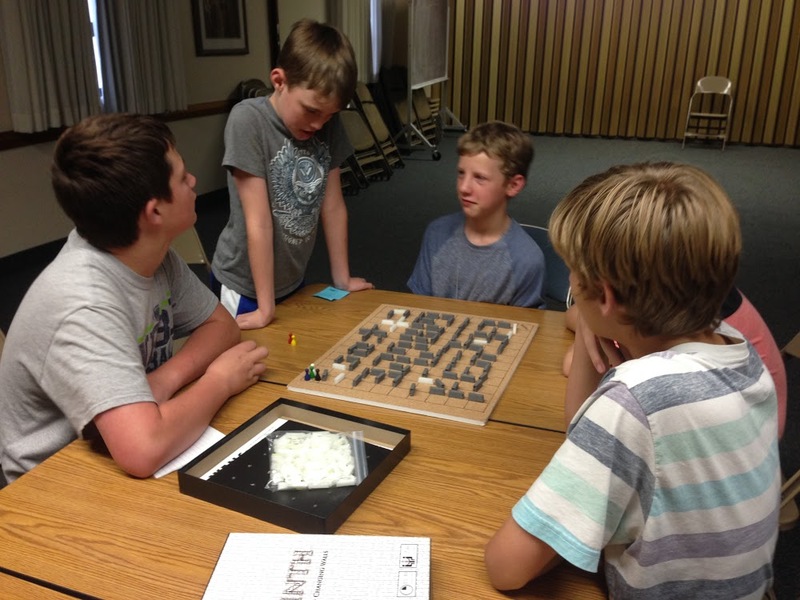 And then there are the kids like those in Boy Scout Troop 107 who created their own board game to earn their Game Design merit badge. Not only did they complete it (and from all I’ve see it looks pretty good), they put it up on Kickstarter and it’s about to fund. Game design offers fun new opportunities for creative children. In fact, if you haven’t yet, check it out on Kickstarter – it ends on the 10th and it’s a fantastic project that is jumping a new generation of young designers into the hobby. It’s easy to think of our hobby as a pastime. After a long day of work, there’s nothing better than sitting down at the table and playing something engaging and challenging, yet also fun and social. But it’s much more than that. I can see it in the way my son looks at a game board or in how young gamers like the boys of Troop 107 are approaching the hobby – this is an opportunity to create something that’s your own, whether building it from scratch or iterating on what’s already there, and if you have fun along the way, what could be better than that.